While the M5 manages to deliver the headline brightness figure that Aaxa claims, this projector does so by almost ignoring basic requirements for color representation. Projector designs often fall neatly into one of two camps: those that are offering portability, and others that can project enough light to be seen easily. Not that the boundary between those distinctions isn’t a bit flexible, and the Aaxa M5 is an example of a product that attempts to straddle both requirements in a single solution. But is it light enough to carry, and yet bright enough to be worth bringing along? According to the specifications, a 48-inch projection requires a 50-inch throw, which is a 1.04 ratio using our calculator. The M5 retails at around £680 – $470 over in the US – and it comes in a fabric carry case that’s been stiffened with plastic to offer greater protection. Inside the case is the (roughly) Apple Mac mini-sized M5, the power supply, a small tripod, tiny remote control and a few potentially useful cables. The unit is just 150mm square and 45mm deep, making it larger than some of the Pico projectors we’ve seen, but obviously small in comparison to a full-scale projector. The projector alone weighs 863g, and together with all the accessories in the travel case, the total weight is 1.84kg. At 900 lumens, Aaxa claims that this is the world’s brightest mini projector, and it can generate a 150-inch display using its 4th-Gen DLP Optical Engine. That quoted brightness assumes a mains power connection, though the M5 will run on an internal battery for 70 minutes if you are willing to accept a reduction to 500 lumens as the trade-off. Available inputs include VGA, HDMI, and Composite A/V, and you can also source media files from USB-connected storage or a microSD card slot. There is also a headphone jack for those who like to project something others can’t fail to notice, but keep the sound to themselves. The unit also has a single 2W integrated speaker for more gregarious types. On the underside is a mount for the accompanying tripod which could be used to place it on a more substantial support, or even be used for ceiling mounting. Instead of including a foot for tabletop deployment, Aaxa angled the optics in the M5 slightly upwards, allowing the projection to avoid hitting the supporting surface. Usually, some clearance is required to avoid overheating, but here the vents are on the top and rear. The underside also has a removable cover where the battery is housed, allowing for the replacement of the Lithium-Ion module with another that the company will sell you for about $50 (around £40). What you can’t switch out is the LED light source. That said, this element is built for up to 20,000 hours use, making replacement less of a concern. 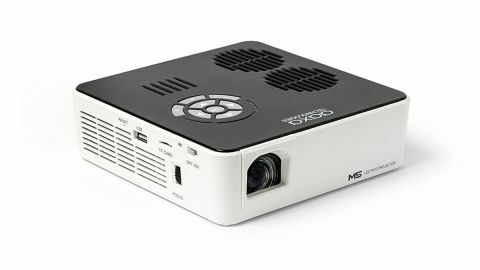 Aping larger projector designs, the M5 has a small control pad on the top that can be used to select options from the interface. This is useful when you (inevitably) misplace the tiny remote control. However, the remote is a necessity for some adjustments, such as keystone alterations. The only other features of note on the outside of this device are a small focus wheel on the right, and an on/off switch that overrides the soft power controls. The internal projection system uses DLP (Digital Light Processing) technology with a native resolution of 1280 x 800 (WXGA), though it will scale a 1080p HDMI signal for presentation. However, note that this projector isn’t a short-throw design, having a ratio of only 1.2:1. That equates to requiring roughly as much distance from the screen as the scale of projection you wish to see.